The Wall is an artwork initiated by Jen Wu in early 2012 – a reclamation and a monument built on grassroots possibility. As of October 2014, it is to be The Salford Wall. The Salford Wall is the creation of an open, community-built space, rebuilt from the remnants of a building whose history is the heritage of Chapel Street, Salford. A history which was almost lost as part of the area’s urgent regeneration, instead and in collaboration with Salford City Council, the east brick wall and stone façade of the 1930’s Old Bank Theatre / Royal Liver Friendly Society building were salvaged from demolition in order to be used as the building blocks for a ‘new’ community-built space. In spring 2014, the building’s remnants were moved 100 meters east to a formerly vacant plot of land, opposite Bexley Square. Here The Salford Wall will be rebuilt – with permission from the council to realise the project within the next 2 years. 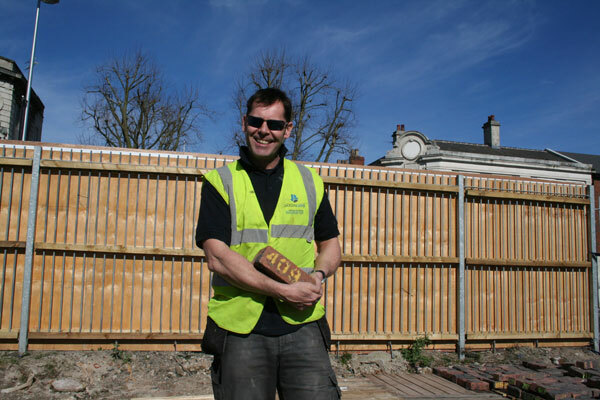 The Wall has been created with minimal funds, and has been enabled to happen through voluntary work and support in kind. As such, it has been a long process- over two years- to get to this stage. 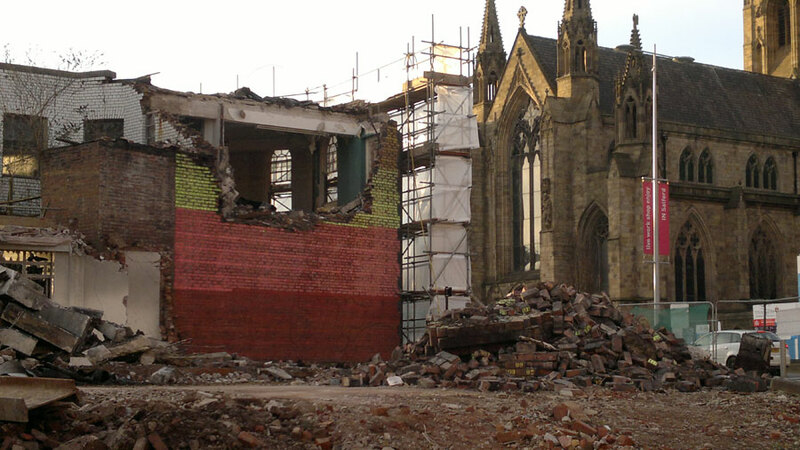 There is still a ways to go before The Salford Wall can be rebuilt. But it is happening, slowly but surely. There are many ways to help and support the project- through which it is hoped it will become an outdoor community event and cultural space. Though much needs to happen to make this a reality. For more info, get in touch via the details at left. 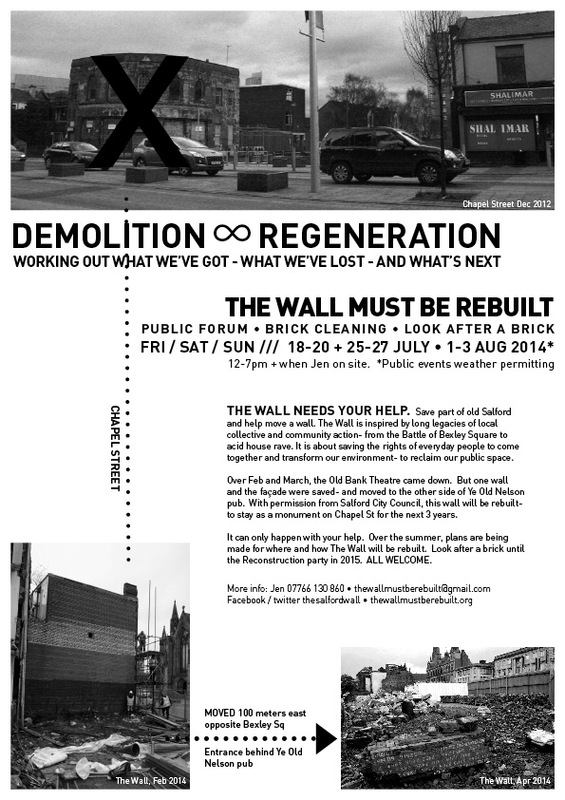 UPDATE MAY 2015: Permission has been obtained from English Cities Fund for THE [SALFORD] WALL, once rebuilt, to stay as a permanent monument on Chapel Street. It is an opportunity in the truest sense to preserve and renew the legacy of why and how the Old Bank Theatre building was built – in 1930, as the Salford branch of Royal Liver Friendly Society — as a physical and financial structure of mutual support built by and for a defiant Northern working class, under severe threat by the aggressive forces of post-1929 government austerity. THE [SALFORD] WALL has always been a project driven by the grassroots. If there has been any failure in the last year, it has been as a failure of vision on my part – to believe the project needed the support of those who hold the reins of money and power for its continued actualisation. It is to betray why and how this building which formerly stood at 301 Chapel Street, Salford was built. It is a betrayal that will be no longer. 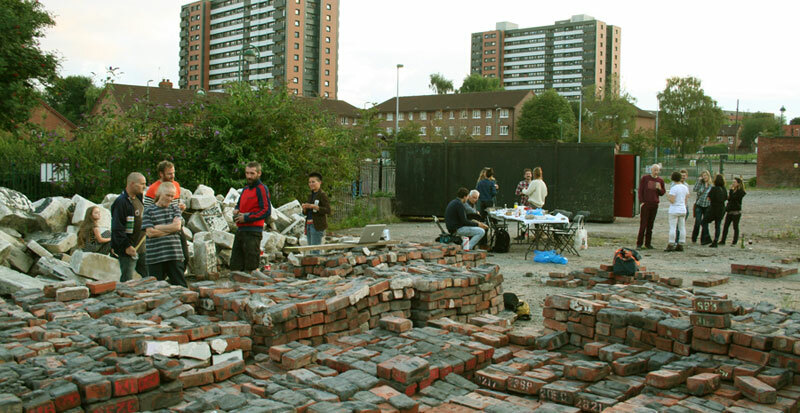 THE [SALFORD] WALL will be the resurrection of not only a physical structure, but also of an alternative ‘banking’ system built from the ruins of the Friendly Society – the precursor to Britain’s social public state. Details will be forthcoming. To stay informed, follow this blog or via the contact details to the left.